Neoterik Reception Desk Mocha Laminate/Frosted PlexiDimensions: 71"W x 36"D x 43.5"H Weight: 210 lbs. Officient, Neoterik Collection, Dimensions: 71"W x 36"D x 43.5"H; Weight: 210 lbs. The Neoterik reception desk is constructed with solid core panels finished in melamine laminate. Matching PVC edging fends off bumps and scratches. The frosted plexiglass under the counter lets light through, and leveling glides compensate for uneven flooring. Ships with assembly required. The furniture color is subject to the title and description, pictures for reference only. We still have other available color, please contact us to get best offer. View More In Reception Room Tables. If you have any questions about this product by Officient, contact us by completing and submitting the form below. If you are looking for a specif part number, please include it with your message. 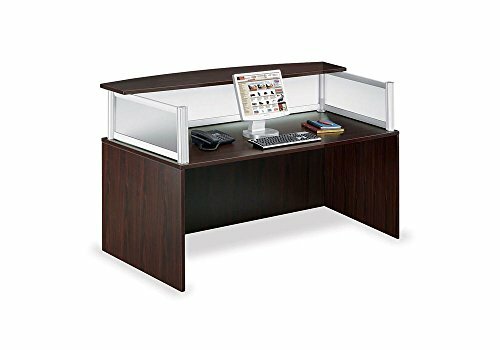 Reception L-Desk with Right Return in Warm Ash Warm Ash Laminate/Brushed Nickel Frame Dimensions: 72"W x 65"D x 42"H Weight: 220 lbs. Marque Curved Reception Station with Plexi Panel - 72"W x 32"D Walnut Finish/Silver Accents Dimensions: 72"W x 32"D x 45.5"H Weight: 118 lbs.